Vote as if your life depended upon it, because it does. This would mean that U.S. fighter-jets and missiles would be shooting down the fighter-jets and missiles of the Syrian government over Syria, and would also be shooting down those of Russia. The Syrian government invited Russia in, as its protector; the U.S. is no protector but an invader against Syria’s legitimate government, the Ba’athist government, led by Bashar al-Assad. The CIA has been trying ever since 1949 to overthrow Syria’s Ba’athist government — the only remaining non-sectarian government in the Middle East other than the current Egyptian government. The U.S. supports Jihadists who demand Sharia law, and they are trying to overthrow and replace Syria’s institutionally secular government. For the U.S. to impose a no-fly zone anywhere in Syria would mean that the U.S. would be at war against Russia over Syria’s skies. Whichever side loses that conventional air-war would then have to choose whether to surrender, or instead to use nuclear weapons against the other side’s homeland, in order for it to avoid surrendering. That’s nuclear war between Russia and the United States. Would Putin surrender? Would Hillary? Would neither? If neither does, then nuclear war will be the result. We should also work with the coalition and the neighbors to impose no-fly zones that will stop Assad from slaughtering civilians and the opposition from the air. Opposition forces on the ground, with material support from the coalition, could then help create safe areas where Syrians could remain in the country, rather than fleeing toward Europe. QUESTION: When you were secretary of state, you tended to agree a great deal with the then-Secretary of Defense Bob Gates. Gates was opposed to a no-fly zone in Syria; thought it was an act of war that was risky and dangerous. This seems to me the major difference right now between what the president — what Obama’s administration is doing and what you’re proposing. Do you not — why do you disagree with Bob Gates on this? CLINTON: Well, I — I believe that the no-fly zone is merited and can be implemented, again, in a coalition, not an American-only no-fly zone. I fully respect Bob and his knowledge about the difficulties of implementing a no-fly zone. But if you look at where we are right now, we have to try to clear the air of the bombing attacks that are still being carried out to a limited extent by the Syrian military, now supplemented by the Russian air force. And I think we have a chance to do that now. We have a no-fly zone over northern Iraq for years to protect the Kurds. And it proved to be successful, not easy — it never is — but I think now is the time for us to revisit those plans. I also believe, as I said in the speech, that if we begin the conversation about a no-fly zone, something that, you know, Turkey discussed with me back when I was secretary of state in 2012, it will confront a lot of our partners in the region and beyond about what they’re going to do. And it can give us leverage in the discussions that Secretary Kerry is carrying on right now. QUESTION: Jim Ziren (ph), Madam Secretary. Hi. Back to the no- fly zone. are you advocating a no-fly zone over the entire country or a partial no-fly zone over an enclave where refugees might find a safe haven? And in the event of either, do you foresee see you might be potentially provoking the Russians? To have a swath of territory that could be a safe zone … for Syrians so they wouldn’t have to leave but also for humanitarian relief, … would give us this extra leverage that I’m looking for in the diplomatic pursuits with Russia with respect to the political outcome in Syria. Bernie Sanders’s response to that was: “I worry too much that Secretary Clinton is too much into regime change and a little bit too aggressive without knowing what the unintended consequences might be.” He didn’t mention nuclear war as one of them. 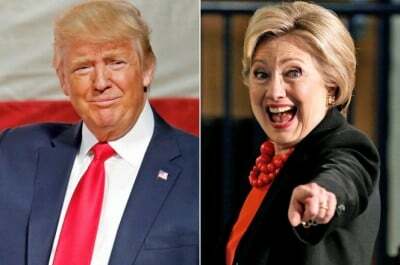 Hillary Clinton has never been asked “What would you do if Russia refuses to stop its flights in Syria?” Donald Trump has said nothing about the proposal for a no-fly zone (other than “I want to sit back and see what happens”), because most Americans support that idea, and he’s not bright enough to take her on about it and ask her that question. Probably, if he were supportive of it, he’d have said so — in which case it wouldn’t still be an issue in this election. Trump muffed his chance — which he has had on several occasions. But clearly he, unlike her, has not committed himself on this matter. Hillary Clinton is obviously convinced that the U.S. would win a nuclear war against Russia. The question for voters is whether they’re willing to bet their lives that she is correct about that, and that even if the U.S. ‘wins’, only Russia and not also the U.S. (and the world) would be destroyed if the U.S. nuclear-attacks Russia. Every other issue in this election pales by comparison to the no-fly-zone issue, which is virtually ignored, in favor of issues that are trivial by comparison. But a vote for Hillary Clinton is a vote for nuclear war against Russia, regardless of whether or not the voters know this. And a vote for Trump is a vote for the unknown. Could the unknown be even worse than Hillary Clinton? If so, would it be so only in relatively trivial ways? This election should be about Hillary Clinton, not about Donald Trump. Vote as if your life depended upon it, because it does.. This could be the biggest revelation yet from WikiLeaks already epic email trove. Will the US media cover this story? This constitutes proof that the Clinton Foundation knowingly accepting millions of dollars in ‘charitable’ donations from the same Gulf states which both Secretary Clinton and President Obama knew were funding ISIS, Al Nusra Front (al Qaeda in Syria) and known takfiri terrorist fighting organizations. WikiLeaks: Hillary Clinton knew Saudi, Qatar were funding ISIS – but still took their money for Foundation. Most likely you are unaware of what Trump is telling people as the media does not report it. A person who speaks like this is not endeared to the oligarchs. —Wall Street and the mega-banks too big to fail and their agent the Federal Reserve, a federal agency that put 5 banks ahead of millions of troubled American homeowners who the federal reserve allowed to be flushed down the toilet. In order to save the mega-banks’ balance sheets from their irresponsible behavior, the Fed has denied retirees any interest income on their savings for eight years, forcing the elderly to draw down their savings, leaving their heirs, who have been displaced from employment by corporate jobs offshoring, penniless. —The military/security complex which has spent trillions of our taxpayer dollars on 15 years of gratuitous wars based entirely on lies in order to enrich themselves and their power. —The neoconservartives whose crazed ideology of US world hegemony thrusts the American people into military conflict with Russia and China. —The US global corporations that sent American jobs to China and India and elsewhere in order to enrich the One Percent with higher profits from lower labor costs. —Agribusiness (Monsanto et.al. ), corporations that poison the soil, the water, the oceans, and our food with their GMOs, hebicides, pesticides, and chemical fertilizers, while killing the bees that pollinate the crops. —The extractive industries—energy, mining, fracking, and timber—that maximize their profits by destroying the environment and the water supply. —The Israel Lobby that controls US Middle East policy and is committing genocide against the Palestinians just as the US committed genocide against native Americans. Israel is using the US to eliminate sovereign countries that stand in Israell’s way. The media concentrated in a few corporate hands has gone all out to convince not only Americans but also the world, that Donald Trump is such an unacceptable candidate that he has lost the election before the vote. By controllng the explanation, when the election is stolen those who challenge the stolen election are without a foundation in the media. All media reports will say that it was a run away victory for Hillary over the misogynist immigrant-hating Trump. That the Oligarchy intends to steal the election from the American people is verified by the officially reported behavior of the voting machines in early voting in Texas. The NPR presstitutes have declared that Hillary is such a favorite that even Republican Texas is up for grabs in the election. If this is the case, why was it necessary for the voting machines to be programmed to change Trump votes to Hillary votes? Those voters who noted that they voted Trump but were recorded Hillary complained. The election officials, claiming a glitch (which only went one way), changed to paper ballots. But who will count them? No “glitches” caused Hillary votes to go to Trump, only Trump votes to go to Hillary. The most brilliant movie of our time was The Matrix. This movie captured the life of Americans manipulated by a false reality, only in the real America there is insufficient awareness and no Neo, except possibly Donald Trump, to challenge the system. Americans of all stripes—academics, scholars, journalists, Republicans, Democrats, right-wing, left-wing, US Representatives, US Senators, Presidents, corporate moguls and brainwashed Americans and foreigners—live in a false reality. In the United States today a critical presidential election is in process in which not a single important issue is addressed by Hillary and the presstitutes. This is total failure. Democracy, once the hope of the world, has totally failed in the United States of America. Trump is correct. The American people must restore the accountability of government to the people. The Failure of Democracy: How The Oligarchs Plan To “Steal The Election” | Global Research – Centre for Research on Globalization. Global Capitalism: A Looming Economic Crisis [OCTOBER 2016] – YouTube. As the Free Thought Project reported Thursday, the most prominent bank in Germany is at risk of failure, with potentially profound effects for the EU, the United States and likely the rest of the world. This risk of failure has now gotten so threatening that a number of funds that clear derivatives trades with Deutsche Bank AG have withdrawn excess cash and positions held at the lender, according to Bloomberg. While the vast majority of the bank’s more than 200 derivatives-clearing clients have made no changes, the hedge funds run on cash highlights serious concern. The paranoia of an imminent collapse spread to the US on Thursday as 10 hedge funds that are Deutsche Bank clients have decided to withdraw cash and listed derivatives positions from the bank, according to a Bloomberg News report. These funds use Deutsche Bank’s prime brokerage to clear their derivatives trades, reports Bloomberg. They post collateral as a sort of insurance in case they run into trouble — but now they appear to worry that Deutsche Bank is the one in trouble. So they are withdrawing some of their derivatives holdings and excess collateral above what Deutsche Bank requires them to hold. 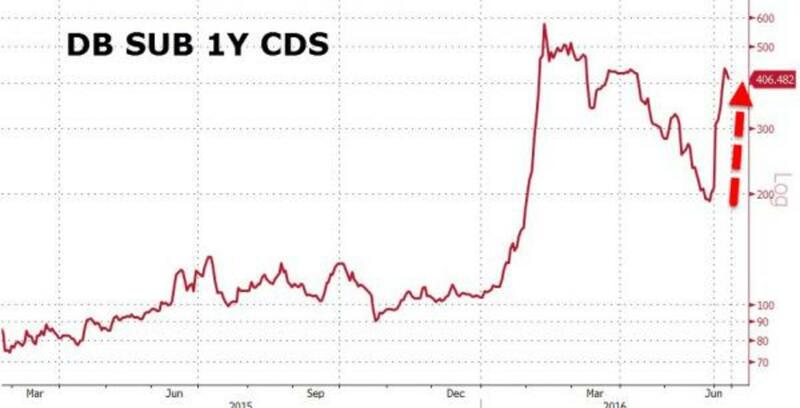 As Zero Hedge points out, this massive withdrawal of cash has led to a sharp increase in short-term CDS. “Our trading clients are amongst the world’s most sophisticated investors,” Michael Golden, a spokesman for Deutsche Bank, said in an e-mailed statement. But this is simply not true. Deutsche Bank is anything but stable as their shares have fallen sharply on the news that German Chancellor Angela Merkel won’t bail them out. Its shares fell by as much as six percent in early Monday trading, making it the worst performance since 1992. Since January, the bank’s shares have lost over 52 percent of their value. As news of the bank run spread on Thursday, the ‘stable’ bank’s shares declined below 10 euros for the first time. The lender’s 1.75 billion euros ($2 billion) of 6 percent additional Tier 1 bonds, the first notes to take losses in a crisis, fell as much as five cents on the euro to 69 cents, a record low, according to data compiled by Bloomberg. The possibility of depositors having their funds taken from them as the bank collapses is not at all isolated as it has happened before. As we pointed out, to keep the bank solvent, the Bank of Cyprus took almost 40% of depositors’ funds – leaving customers with essentially nothing they could do about having their money stolen. Assets were frozen and ATM machines were not refilled. 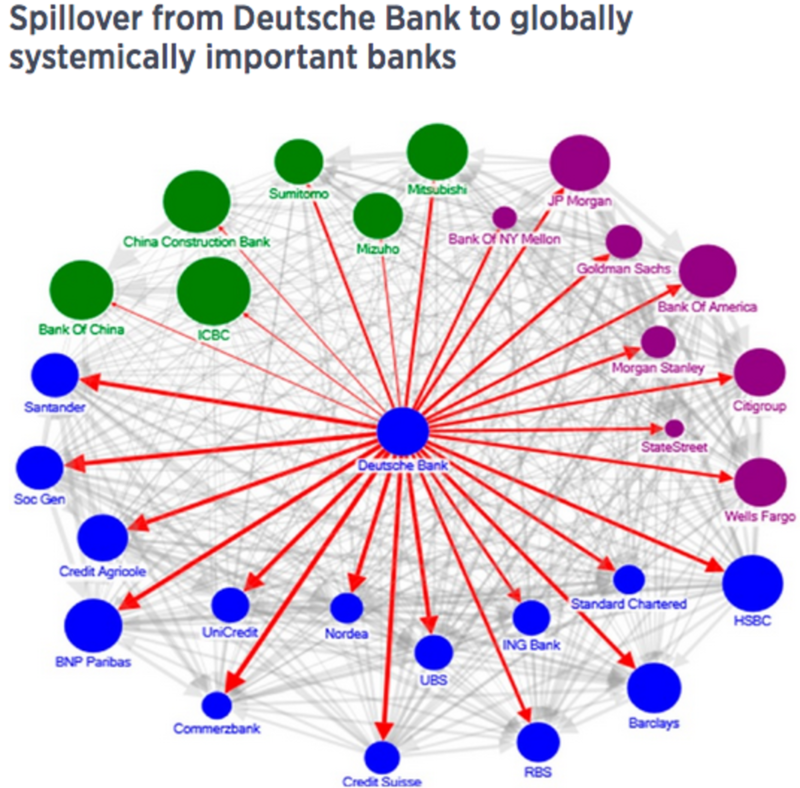 As Jay Syrmopoulos points out, the collapse of Deutsche Bank would most likely begin a cascade of Western banking institutions falling like dominoes (which could include Barclays in London and CitiGroup in the U.S.). According to same expert who valued Lehman’s worth at its collapse, Deutsche Bank’s current value of $1 trillion dollars is significantly more than Lehman Brothers’ valuation during their collapse in 2008. The graphic below shows the severity of the impact and implications for contagion a Deutsche Bank implosion would have. In fact, the contagion has already begun. News that some hedge funds were pulling positions and excess collateral from Deutsche Bank caused shares of U.S. banks to quickly reverse early gains, according to Bloomberg. But don’t worry, just as Lehman Brothers maintained in the beginning of 2008 that everything was fine and dandy, Deutsche Bank is doing the same. In a memo to staff published on Friday, as reported by Bloomberg, Deutsche Bank Chief Executive Officer John Cryan responded to what he called media speculation causing some “unjustified concerns,” saying that the bank’s balance sheet has never been more stable over the past two decades. Run on Banks Begins — Deutsche Bank Clients Begin Withdrawing Excess Cash. Global Capitalism: Labor Day, The Condition of the Working Class [SEPTEMBER 2016] – YouTube. We Are Being Groomed for the Next Big War – YouTube.